Dr. Feldman has extensive experience in treating a variety of complicated congenital and developmental spinal deformities in children and adults. One of the most common types of spinal deformity. Idiopathic scoliosis is a condition that causes the spine to curve to the side. Mild cases that do not cause pain or discomfort require no treatment. However, cases that are moderate to severe require treatment determined on a case by case basis. Lateral curving of the spine that occurs in children whose vertebrae are abnormally formed during their development in the womb. This abnormality develops in the fetus at 4 to 6 weeks of gestation. Also known as Scheuermann's disease, Scheuermann's Kyphosis is a condition in which the normal shape of the upper spine (called a kyphosis) is deformed, resulting in a hunchback appearance. This condition occurs when the front of the upper spine does not grow as fast as the back of the upper spine, causing the vertebrae to become wedge shaped. A condition which occurs at birth as a result of segmentation failure or a defect in the formation of the vertebrae which causes forward bending of the spine and a hunchback appearance (kyphosis). If left untreated, congenital kyphosis can lead to paraplegia, a loss of movement and sensation in the lower body. Individuals with achondroplasia and other dwarfisms usually have a degree of scoliosis. Many of these patients have lordosis of the spine, which is an inward curving of the lower back. If severe enough, lordosis can make it difficult for a child to sit, stand, or walk. If the condition occurs in the thoracic (upper) region of spine, the distance between the spine and chest is reduced and the child may have respiratory problems. If lordosis occurs in the lumbar (lower back) region, the spine may approach the abdominal wall. Muscular Dystrophy causes progressive muscle weakness and deterioration. It is caused by gene mutations that affect the development of normal muscle mass. As the disease progresses, affected individuals may lose the ability to walk and may have diffiulty swallowing and breathing. Spinal Muscular Atrophy is a genetic disorder that affects muscles. Genetic mutations interfere with the development of motor neurons in the spinal cord and brain. Motor neurons are specialized nerves that connect at the muscles and communicate with the brain and spinal cord. The loss of motor neurons leads to muscle weakness and deterioration. As the disease progresses, affected individuals may lose the ability to walk and may have diffiulty swallowing and breathing. Spinal Stenosis is the abnormal narrowing of the spinal column, resulting in compression of the spinal cord. Affected individuals will feel pain, weakness, and numbness at the compression site. Stenosis can occur in the lumbar region (lower spine), sacral region (upper spine), and less commonly in the thoracic region (middle spine). Spondylolisthesis is a condition where a vertebra (typically the 5th lumbar vertebra) slips out of place onto the vertebra below, causing misalignment and narrowing of the spinal column. This places pressure on the spinal nerves resulting in pain in the back, buttocks, and/or legs when walking or standing. As the spine tries to stabilize itself, the joints between the slipped vertebra and adjacent vertebrae can become enlarged and pinch nerves. Spinal compression fractures occur when the normal vertebral body of the spine is squeezed or compressed. The bone collapses when too much pressure is placed on the vertebrae possibly resulting in pain, limited mobility, loss of height, and spinal deformities. In cases of severe compression fractures, the vertebral body is pushed into the spinal canal which applied pressure to the spinal cord and nerves. 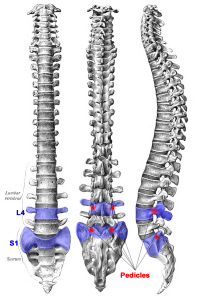 A rare condition that occurs when the sacrum (lower spine) fails to form properly. Severe cases of sacral agenesis can lead to lumbosacral agenesis, the partial or complete absence of lumbar vertebrae and lower thoracic vertebrae. Maternal diabetes and deficiencies in a mother's diet can cause sacral agenesis. A deformity of the bones at the base of the skull that occurs when the base of the skull is pressed by the upper portion of the cervical spine. This condition may cause neurological damage due to a disruption of the flow of cerebrospinal fluid. Primary basilar impression is associated with other vertebral defects such as Klippel-Feil syndrome, odontoid anomalies, and atlas hypoplasia. Secondary basilar impression occurs when the osseous structures at the base of the skull become soft. A condition characterized by partial or complete union of the first cervical vertebra atlas and the base of the occiput of the skull (occipitalization of the atlas). Common symptoms include weakness and lack of coordination in the lower limbs and sometimes in the upper limbs. Some children may develop symptoms after trauma, but many children do not experience symptoms at any point in life.